As I was sorting last week’s CSA vegetables and making plans for them, I came upon a couple of eggplants that left me stumped. Although they were eggplants of the Mediterranean variety, I just wasn’t in the mood for ratatouille or eggplant parm. What I really wanted from those eggplants was a Thai kind of curry, and then I found this dish in The Vegetarian Table Thailand . When big chunks of eggplant get to simmer in a coconut milk-based sauce, they become tender and enriched with flavors from the spices and herbs. They become silky-textured, almost buttery chunks that absorb all the flavors around them, and this is possibly my favorite way to eat eggplant. The recipe has a very long ingredient list but it’s actually very simple to prepare. First, the eggplants were chopped and salted and left in a colander for 10 minutes before being rinsed and dried in a towel. Then, coriander and cumin seeds were toasted and ground to a powder. Coconut milk was warmed with red curry paste and the ground spices. 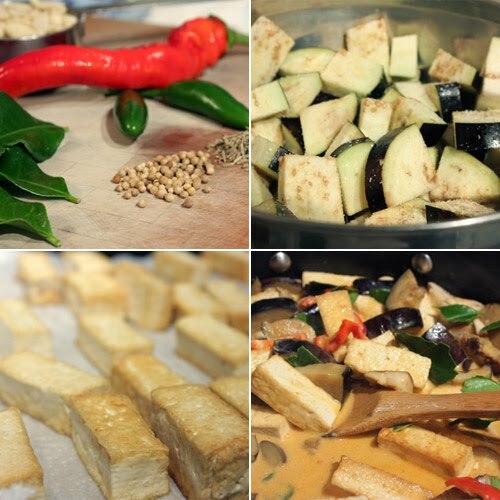 Meanwhile, tofu chunks were fried, and then the dried eggplant chunks were fried. Once the fried items were all draining on paper towels, some chopped shitake mushrooms were stir fried with peanuts, and then the tofu and eggplant were added to the pan. The coconut milk mixture was poured over the vegtablesa and tofu and that was all left to simmer for a few minutes. Thinly sliced kaffir lime leaves, basil, sliced chiles, and a little soy sauce were added while it simmered. You really can’t go wrong with the combination of coconut milk, lime, and chiles. 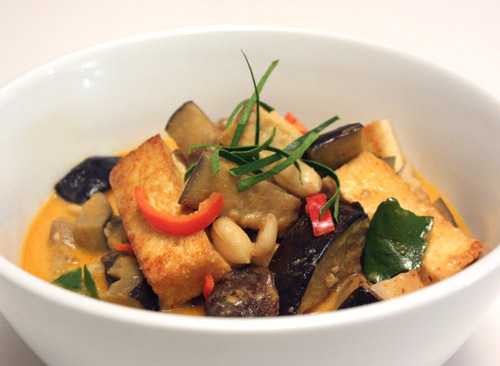 The tofu and eggplant acquired that mix of flavors and the mushrooms and peanuts added dimension. The curry just got better as the leftovers sat in the refrigerator overnight, and it was even more delicious for lunch the next day. Lisa, this looks so comforting! I love eggplants, but never tried such a dish. I love it's combined with curry paste and peanuts. I wish I could find tofu and coconut milk here. So beautiful, Lisa. I have to admit that I don't usually like eggplant in Thai dishes, but you make it look appetizing here. I love tofu. I haven't had it in along time. Perfect match with curry and veggies. Yum!!! I think tofu is an under-appreciated food. That looks absolutely wonderful! I feel like I can almost smell it. This looks just simple, delicious and downright awesome! I want some now, but of course will have to wait. I so miss eating eggplant, the hubby is allergic and I never buy it anymore. This looks like it was delicious. Love the looks of the soupy sauce and the addition of eggplants in it. tofu and curry go so well together! this is a beautiful dish! Just give me a big bowl of rice, and I'd be one very happy camper with this tofu dish. Total comfort! Very gorgeous looking curry. Love the combinations. Looks good! This looks excellent! I love eggplant but get bored with it. This is definitely a new and delicious way to prepare it. I can imagine how good it is after soaking up those flavors! A delicious and colorful curry, yum! We love tofu, and this looks great. I'm glad you made the top 9 because we missed your posting the first time around. Congrats, and great recipe! Believe it or not I have never tried tofu before - but a curry is always the best way for me to try new things! I love curry, so much and eggplant (aubergine) is always a great addition. Will really need to try tofu sometime soon! Wow! This is definitely something I should try! 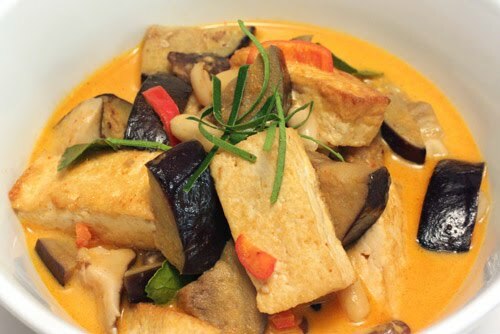 Love eggplant, lukewarm about tofu, but this combination really sounds great! I love eggplants in curry. This is such comfort food for me! What a great way to enjoy eggplant, your curry looks awesome! I love eggplants in curry too! They just soak up all that spicy goodness. LOL ..surprised no one tried to make it though ..picture says thousand words isn't it.